SURTRON® is a radiosurgical unit which is suitable to light and medium surgery. SURTRON®, by means of the selections of the unit’s performance, allows pure cut CUT, coagulated cut BLEND, superficial coagulation COAG FORCED, deep coagulation, in absence of carbonization, COAG SOFT and, with a special adapter, bipolar coagulation BIPOLAR. The digital reading of the delivered power and the operative function’s monitoring by microcontroller guarantees the absolute reliability of working conditions. SURTRON® allows a highly professional surgery thanks to the ergonomic and safety solutions normally utilised. 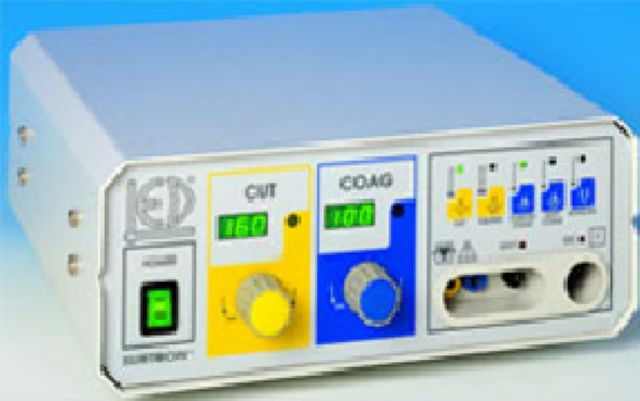 It is continually monitored the connection of neutral electrode and, if a split neutral electrode is used, the neutral electrode to patient contact. The possibility to control the output functions, as well as the output power level, by the handle, allows to implement the surgical operation without turning away the surgeon attention from the surgical field.